Paddle tennis is a game adapted from tennis and played for over a century. Compared to tennis, the court is smaller and has no doubles lines, and the net is lower. Paddle tennis is played with a solid paddle, instead of a strung racket. The tennis balls are depressurized and the players serve underhand. The same court is used for singles and doubles, and doubles is the most common form of play. Paddle tennis traces it's roots back over 100 years to its development by an episcopal minister, Frank Peer Beal, in lower Manhattan. Wanting to create recreational activities for neighborhood children, he got the city's parks and recreation department to lay courts in Washington Square Park in Greenwich Village in 1915. The first tournament was held in 1922, and the United States Paddle Tennis Association was formed the following year. 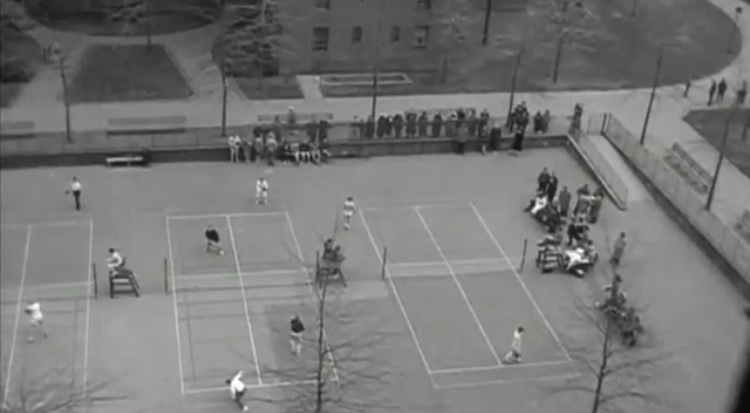 By 1941, paddle tennis was being played in almost 500 American cities! During the 1920's, a group of young St. Augustine men began playing a game similar to paddle tennis on the beach. They drew off courts in the hard packed sand and hit a tennis ball back and forth with their hands. Later, a net and homemade paddles were added. Prominent among these early players was Leslie Stephens, a local attorney, who continued playing beach paddle tennis into his 70's and placed second in the Labor Day tournament in 1974. The game continued to be played on St. Augustine Beach into the 1960's when it was taken up by W.S. "Buddy" Davis, principal of the Blind Department at the Florida School for the Deaf and Blind in St. Augustine. Davis began promoting and teaching the game to all who were interested, including a group of young teachers at his school. During the late 1960's, the D&B group began having a picnic on the beach on Labor Day weekend, and beach paddle tennis was always one of the main activities. At the 1973 picnic one of the teachers, Tom Parragin, was ill and could not play. So it was decided that he would organize the picnic players and run a small tournament. Almost as a joke, Davis wrote the results of the tournament for the St. Augustine paper, calling it "World Championship Beach Paddle Tennis Tournament." Since one of the winners, Walt Slater, was a former football standout for the University of Tennessee and Pittsburgh Steelers, the wire services picked up the story and ran it nationwide. The news of a "World Championship" paddle tennis tournament in Florida was read by an astounded Murray Geller in New York. He immediately contacted Davis, and came down to Florida for the next tournament. He was amazed to find the locals still playing the game by the pre-1959 rules. He promptly explained the modern version of the game to them and the rule changes were adopted. During the 1970's, the sport of beach paddle tennis continued to grow and win converts in St. Augustine. Through the efforts of Davis, Jack Driskell, Chester Benet, and many others, two hard courts were constructed at Ron Parker Park in St. Augustine Beach. The two courts became four, then six and lights were added as popularity of the port continued to grow. Eight more lighted courts were built at Treaty Park when it opened in the early 1990's. Paddle tennis is now played by every age group in St. Augustine. It has been introduced in the school system by physical education teachers. A league sponsored by the St. Johns County Recreation Department runs year round with women's, men's, idea doubles and juniors divisions. It is truly a sport for all ages and abilities.